The continual radical propaganda from Maori broadcasting helped stir up a new wave of Maori protest activity. 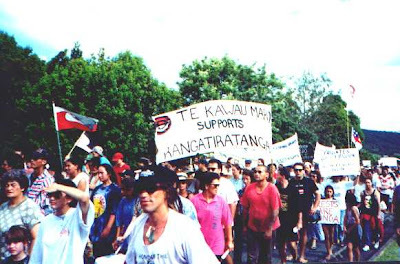 In the mid '90s, occupations at Moutua Gardens, the Rotorua Maori Arts and Crafts Institute in Rotorua, arsons, assaults, courtroom protests and vandalism brought a new wave of Maori activists to the fore. Ken Mair, Mike Smith, Niko Tangaroa and Tame Iti became the new bogeymen. This "new wave" however was not so new. It was a direct descendant of '80s activist groups such as Syd Jackson's Te Ahi Kaa, Mat Rata's Mana Motuhake and of course the trade union movement. Ken Mair, an ex-navy diver, was seven years Maori officer with the socialist controlled Post Primary Teachers Association and an official in Mana Motuhake. The late Niko (Nick) Tangaroa spent many years as an organiser for the Engineers Union and Mike Smith (Libya 1988)was involved with the Labourers Union. 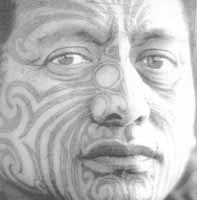 Tame Iti was a veteran of Nga Tamatoa and the Communist Party, travelled to China and worked through CORSO, the Pulp and Paper Workers Union and Eva Rickard's Mana Maori Party. Another old time "new waver" was Joe Rickit, Wellington political spokesman for Te Ahi Kaa and a member of Hone Harawira's Te Kawariki. Rickit had been a Labourers Union official, a member of the Porirua branch of the Socialist Unity Party and involved with the Wellington branch of the Communist Party. Rickit is now coordinator for the National Association of Maori Mathematicians, Scientists and Technologists. Few, if any of the '90s Maori radical leaders did not have Marxist/Leninist and/or trade union connections. The "New Wavers" also had a dedicated non Maori support network. This web included CORSO, and the Christchurch based group, Action For An Independent Aoteoroa (AFIA), which organised Waitangi Day protests at Okains Bay, near Christchurch, annually for a decade. AFIA leader, Joe Davies, now an organiser with Matt McCarten's UNITE union is as radical as they come. He has been active in HART, CORSO, the NZ/USSR Friendship Society and other socialist groups. As he wrote in Monthly Review, November 1988., "Pakeha communists must get actively involved in supporting Maori struggles for national independence and self-determination. We have to seek out those issues that will further the aims of nationalism..."
Incidentally Davies probably earned his credibility with the radicals during the 1986 royal tour of New Zealand when he proudly bared his backside to Queen Elizabeth. Davies performance (a traditional Maori insult) was possibly the real inspiration for Her Royal Highness' description of that disastrous year for the Royal Family, 1992.. "Annus Horriblis." I'm afraid I must protest at the use of the image next to my write-up on your blog. I only hope people do not think it is me, and ask that you make it clear that it isn't. Couldn't you have used someone with a better-looking bum? This is bordering on the libelous! I have a photo of the actual bum-baring event somewhere, with the Queen in evidence. I could let you have it gratis in return for all the free publicity you give to me and my friends. Honestly, your blog is sometimes the only thing that cheers us all up and makes us feel we do matter after all. Thanks Joe, the genuine photo would be much appreciated. I think few were fooled by my feeble, fraudulent, focus on your finer features. If I were more adept at photoshop I would have put a hammer on one cheek and a sickle on the other to match your famous tattoos. National association of Maori mathematicians, scientists and technologists. Now that is funny! I remember working in Wellington in the construction industry around 1977 when the building site I was employed on was visited by members of the then Auckland carpenters union. They were touring the country collecting money for the striking workers on the Auckland/Mangere bridge project. A bigger bunch of thugs I had not seen in a long time. i chose not to contribute to what I saw as simple standover tactics by people with a political agenda the opposite of mine. They suggested bad things might happen to me if I didnt show some solidarity. Because I could "look after myself" nothing did. But i suspect many of my fellow workers wished they could have done similar to me, but unlike me they were intimidated into compliance. While in Wellington these stalwarts of the union movement stayed at the James Cook hotel which was The best in town at that time. Over the years I had a few run in's with the then Wellington Carpenters union rep which came close to blows on a few occassions. His name was Danny- somebody. I cant remember, it might come to me.